Clenching or grinding of teeth can tighten the jaw muscles leading to a stressed TMJ. Any trauma or disease can damage the joint in a direct way or by causing a tear or stretch in the muscle or ligaments. The cartilage disk present within the joint (that provides a cushioning effect while jaw functioning) can slide from its original place. The cause can be any of those mentioned above but the result remains the same irrespective of the nature of the cause and that includes a malaligned bite, clicking, popping or grating sound during mouth opening or difficulty in opening the mouth wide. How to know if I have A TMJ Disorder? Just go through the list of the questions listed below. The more number of ‘yes’ you have, the more are the chances for you to have TMJ disorder. Do you find your mouth sore or muscles stiff when you get up from sleep? Are you suffering from headaches or neck aches every now and then? 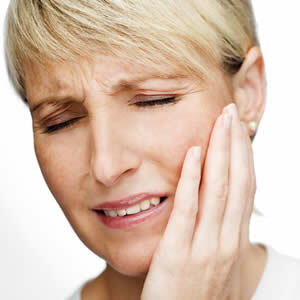 Have you observed an increase in pain while clenching teeth? Does your pain increase during stress? Do you hear some funny sounds like clicking or popping or grating when you open your mouth? Does mouth opening become difficult during yawning or eating? Did you undergo any previous trauma to your neck, jaws or head? Do you have arthritis or any other joint-related disease? Do you find your teeth (two or more) not touching each other while biting? Are you finding it difficult to bite or tear food with your front teeth? Do you have sensitive, loose or worn teeth? The earlier you are able to make out that you have TMJ disorder, the earlier and better will be the management. For the improvement of jaw function, our surgeons have various treatment options based on a thorough evaluation of the patient condition. After the diagnosis of the TMJ disorder the treatment commences. Successful treatment relies on self-care along with professional help and care. Maintain proper postureThe main aim during the initial phase is to reduce pain and muscle spasm. Therefore, painkillers, muscle relaxants or anti-inflammatory drugs are prescribed. Injection of botox or steroids is done directly into the TMJ.Physical TherapySplint TherapyWhat About Surgery? If your TMJ disorder has led to teeth alignment problems, treatments like bite adjustment (equilibration) or orthodontic treatment with or without jaw reconstruction, or restorative dental procedures have to be opted. In this case, a splint (also called as a nightguard) is put on the upper or lower teeth so that they remain apart and the muscles remain relaxed thereby decreasing pain. There is variety of appliances used for various purposes. A nightguard is one that prevents clenching or grinding of teeth thereby reducing tension in jaw muscles at night. It also protects the surface of the joints and the cartilage. On the other hand, an anterior positioning appliance keeps your jaw to the fore. This way undue pressure on the jaws is relived and disk gets stimulated to undergo repositioning. It can be worn 24 hours a day to facilitate jaw healing. A number of physical therapy procedures are used to treat TMJ disorders. At times, you may be referred to the suitable specialist or may be asked to do jaw exercises, go for electrical stimulation, posture guidance, ultrasound and biofeedback.